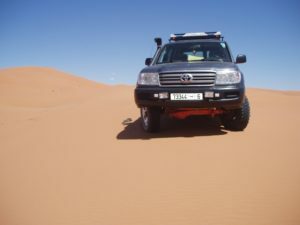 We also organise the Tour of the dunes with our car 4×4, to the happiness of the travellers, to better discover the different tracks which lead to the magical landscapes in the desert. Visit to Khamlia, the village of the men of the origins of the Black Africa. You will leave carry by the rhythm of the Gnawa music sipping tea (possibility to attend of small activities, for children, organized by a local association). Then we come to the doors of the gigantic Hamada of Guirb to Taouz. This ksar, known for its rock engravings (old about 9500 years), is of ancient Kasbah (villages) Berbers built at the beginning of years of the French protectorate. We are resuming then a gang of 12 kms which leads us to the village Begaa: it is a small town Saharan almost 300 people who are divided in nearly 40 families, gathered around a traditional irrigation system which supplies a small oasis. It is also in this hidden corner in the desert that some animals (dinosaurs, sharks…) have preferred to finish their existence there thousands of years of course! Subsequently, the current inhabitants have discovered the bones and teeth, fossilized of these animals. This discovery allows the premises to benefit a livelihood which they have greatly need. Breakfast at a Berber family.